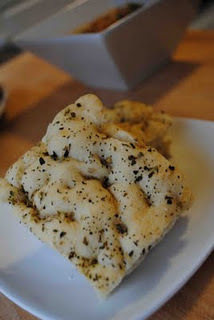 To go along with our "blustery spring" soup dinner on Monday, I wanted to try my hand at making some focaccia. Up until now, I have never made focaccia before, but I had heard it was easy. When I found this recipe on Delish, I knew it would be the perfect pair to my snowy day soup meal. I switched up some of the seasonings to suit our tastes, so feel free to do the same. If you could only smell my kitchen while this was in the oven...it was amazing! I can't wait to try out different flavor combinations. In the bowl of a stand mixer fitted with the paddle attachment, combine the water, oil, salt, flour, and yeast. Mix on high for about 1 minute, until the dough is smooth, elastic, and sticky. Meanwhile, spray a 13x9 inch baking sheet with non-stick cooking spray and also drizzle in some olive oil. Using your hands (and spraying them with cooking spray or olive oil) press the dough into the prepared baking pan, pushing it into the corners. Cover the pan with a towel and let it rest for 60 minutes, or until the dough is puffy. Preheat the oven to 350 degrees. Once the dough has risen, uncover the pan and use your fingers to make dimples all over the dough. Drizzle with olive oil and sprinkle the top with seasonings. Bake for 35-40 minutes, or until the bread is golden brown. Remove the pan and allow to cool for 5 minutes, then turn the bread out of the pan. Do not leave it in the pan, or it will become soggy. Serve warm or at room temperature.